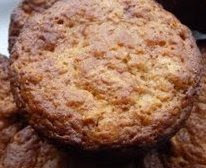 It may be gloomy on the outside, what with cloudy, wet skies and cool temperatures, but that makes it a perfect morning to whip up a batch of Hubby's favourite Oatmeal Muffins. Crispy on the outside with a hint of chewy spiced oatmeal on the inside, these are MARVELOUS with a fresh cup of coffee or tea. Grease 12 medium muffin cups. Add liquid to dry ingredients and stir only until combined. (Batter will be lumpy). Fill muffin cups 2/3 full. Bake in preheated 400 degree oven for around 18 - 20 minutes. Yum! My husband went through a muffin stage when he wanted muffins for breakfast everyday. Now days we usually have oatmeal, but boy does a muffin ever sound good! PS, we might be kindred spirits. I've found quite a few through blogging. It's so much fun to find people the appreciate old movies, books and gardens. And just plain pretty things! Holy moley. That sounds like a great, big, thick cookie to me! Delish! I've already printed out your recipe. As soon as you mentioned crispy and chewy you had me. Sounds like they have some real "character" to them, as my Dad would say. Oh, my...this is such a lovely spot in blogland! I breathe deeply when I visit. I must try those muffins. I know my husband would love them! And I love your reading recommendations, too. Happy Summer Day! Great way to start the morning! Thanks for sharing. I am just about to make a batch of snickerdoodles! There's nothing better than a muffin straight out of the oven to warm up the day. :) These look delicious. I am always looking for new and delicious muffin recipes, and thanks to you I found one. I can't wait to try these. Oatmeal tastes good every way I try it.